This study provides evidence that huperzine A has no demonstrable cognitive effect in patients with mild to moderate Alzheimer's disease. This one falls into the category -- don't believe the hype. 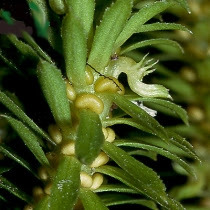 Back when I first started doing research on Alzheimer's disease there was a lot of hype about Huperzine A. Huperzine A, is a naturally occurring sesquiterpene alkaloid found in the plant extracts of the firmoss Huperzia serrata. There was a school of thought suggesting that Huperzine A might cause cognition enhancing activity in some Alzheimer's patients. There was even an ongoing phase two clinical trial. The most amazing part was that Huperzine was already being sold and was readily available as a "so-called" dietary supplement for memory loss and mental impairment. Way back when, I was amazed at how many people were coming to the Alzheimer's Reading Room (ARR) for information on Huperzine. You have to remember that at the time the ARR was tiny in size. I was intrigued to the point where I started to search the available research in China where the herb (moss plant, Huperzia serrata) has been used for hundreds of years. Eventually I learned that Huperzine and cholinesterase inhibitors like donepezil (Aricept) do not mix. The results of the clinical trial are now in. Objective: Huperzine A is a natural cholinesterase inhibitor derived from the Chinese herb Huperzia serrata that may compare favorably in symptomatic efficacy to cholinesterase inhibitors currently in use for Alzheimer disease (AD). Methods: We assessed the safety, tolerability, and efficacy of huperzine A in mild to moderate AD in a multicenter trial in which 210 individuals were randomized to receive placebo (n = 70) or huperzine A (200 μg BID [n = 70] or 400 μg BID [n = 70]), for at least 16 weeks, with 177 subjects completing the treatment phase. The primary analysis assessed the cognitive effects of huperzine A 200 μg BID (change in Alzheimer's Disease Assessment Scale–cognitive subscale [ADAS-Cog] at week 16 at 200 μg BID compared to placebo). Secondary analyses assessed the effect of huperzine A 400 μg BID, as well as effect on other outcomes including Mini-Mental State Examination, Alzheimer's Disease Cooperative Study–Clinical Global Impression of Change scale, Alzheimer's Disease Cooperative Study Activities of Daily Living scale, and Neuropsychiatric Inventory (NPI). Results: Huperzine A 200 μg BID did not influence change in ADAS-Cog at 16 weeks. In secondary analyses, huperzine A 400 μg BID showed a 2.27-point improvement in ADAS-Cog at 11 weeks vs 0.29-point decline in the placebo group (p = 0.001), and a 1.92-point improvement vs 0.34-point improvement in the placebo arm (p = 0.07) at week 16. Changes in clinical global impression of change, NPI, and activities of daily living were not significant at either dose. Conclusion: The primary efficacy analysis did not show cognitive benefit with huperzine A 200 μg BID. Classification of evidence: This study provides Class III evidence that huperzine A 200 μg BID has no demonstrable cognitive effect in patients with mild to moderate AD. Study funding: Supported by the NIH/NIA and Neuro-Hitech, Inc. The manuscript was shared with representatives of NIA.